When looking for a new business loans the first thing that many business owners do is to check out a price comparison website. However, let the buyer beware, or as they say in Latin, “caveat emptor” - not all price comparison websites accurately reflect the costs each loan entails. There are various factors that can influence the positioning of a company on a comparison website as well as what the listing looks like. What many people do not realise is that these factors can have nothing to do with the actual value of the loan! Read on . . .
Firstly, a company can use a bidding process to feature on comparison websites. The way this works is comparable to PPC (Pay Per Click) advertising, where companies can bid for their advertisements to appear on a search engine results page. Similarly, for a price comparison website, a company’s position can be influenced by how high they bid rather than other criteria. Furthermore, the highest bidders may also get additional options for their listing, such as 'unlocked' editing features. This enablesa company to personalise its listing, making it look more attractive. By attracting the user's attention to their listing, this can result in better-value loans being overlooked by all but the most diligent users. Finally, it is worth bearing in mind that not all companies decide to list themselves on price comparison sites. There are many reasons for this, but ultimately it means that price comparison websites only compare the companies that choose to advertise this way, which is a limited subset of all available options. This in turn means that price comparison websites are almost inevitably going to miss out companies with cheaper products and services than those being featured as the ‘best deals’. misleading lending, which covers how advertised interest rates may not reflect the ultimate price you will pay for a loan. 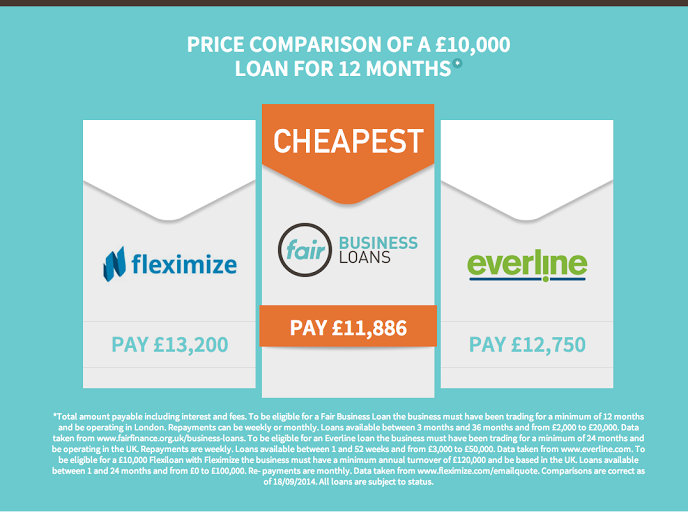 As you can see from the above, for the amount and duration used in the comparison, Fair Business Loans offers the best value for a small business loan! We are seeing an increased number of small businesses wanting to refinance their small business funding after realising that they are not, in fact, getting as good a deal as they had been led to believe. We will focus on this issue in a future blog. For now, rest assured that whether you are seeking a brand new business loan or looking to refinance your existing debt, we will consider your application fairly and with attention to your individual situation. Contact us today to get things started!